Robin, verifiably the greatest sidekick ever, is always equipped and ready for a night of fighting crime. No evil-doer or thorny bush can stifle that most grand of ambitions: making sure every supervillain is locked safely behind bars and the residents of Gotham can stroll the streets with peace of mind. When Batman or the Teen Titans don't need help with some grand goal, word on the street is that sometimes Robin patrols the streets alone, in just a t-shirt, jeans, and sneakers—but he's always got these bad boys in his back pocket, just in case. 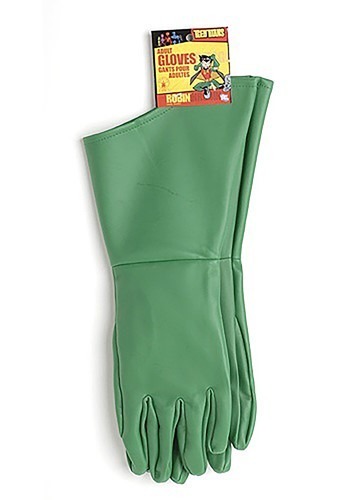 Perfect for crime fighting, these 100% vinyl green superhero gloves run all the way back to the forearm to protect Robi—erm, we mean the to protect whomever the hero may be from all the inevitably nasty stuff that could bust up hands. But—don't be offended—you'll leave the crime-fighting to the professionals, right? Gloves fit well with the costume, well made and will last a long time.